Tradeshows and events can sometimes make or break your company. Your latest prospect arrives at your booth and asks to speak to your salesperson. Unfortunately, the salesperson left the booth about 5 minutes ago. The prospect says they’ll come back later….yeah, right. Opportunity knocked but nobody was there. To solve this problem, Long Range Systems introduces instant staff communication. Each of these systems can eliminate missed opportunities like the one described above. Our solution to staff communication is the 4 line alpha which is below... this pager can recall staff instantly and provide a more professional service to potential customers at Tradeshows. You can purchase systems, or if you are interested in renting, please contact us for information on renting XYZ Pager Co equipment. 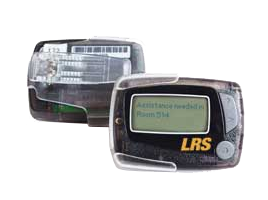 Recall your staff immediately with the 4 line alpha staff recall pager system, staff can wear one of these at all times. It comes with a clip so it can be attached to an item of clothing. As soon as a member of staff is needed the 4 Line pager will immediately page informing them to make there way back to there stand. Not only can the 4 line alpha be used to recall 1 member of staff but also it can be a group of staff. If you need recall all members of staff you don't need to individually page them all...you can just page the group so that they all receive the page at the same time. The 4 line alpha is a text pager and can have custom messages, the pager can hold up to 25 canned messages and you can choose on the system which message you need to send to that pager it could be "Assistance Needed" or it can be a reminder of a meeting the 4 Line is the perfect solution for staff paging especially when at tradeshows or events. To contact us regarding more information about the 4 line alphanumeric then please contact us today using our online contact form where a member of staff will be in contact with you within the next 24hours monday-friday 9am-5.30pm or call us and speak to us directly on 01782 537000 where a member of our team can provide you with the information you need to improve the way you communicate as a business.